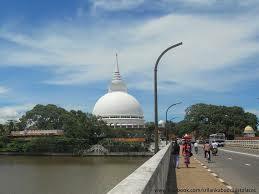 Kalutara is historically important due to the fact that it was one of the 32 places indicated by Arahant Mahinda Thera to the king Devananpiya Tissa in the 2nd century B.C. 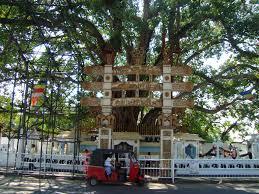 as a place where one of the thirty two saplings of the sacred Sri Maha Bodhi tree in Anuradhapura be planted, to which the King extended his patronage. 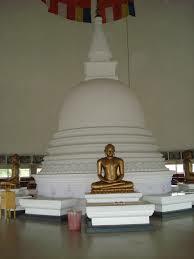 It is recorded in the Sinhala Maha Bodhi Wansa that until such time when the maritime provinces were subjugated by the Portuguese in 1505 A.D., the historic Kalutara Bodhiya exited intact. In the 16th century this sacred site was turned in to a Portuguese fort. Though no harm is supposed to have done to the Bodhi it was not venerated by the people during that period. It was after the planting of a Bodhi in lower terrace of Pahala Maluwa by an Indian Prince from the Pandya country named Wickrama Pandya in 1042 A.D. that the public began to venerated and consider the site as a sacred place. This prince from Indian became a viceroy in the Kalutara area. After the Portuguese, the Dutch too use of the present upper terrace or the uda maluwa area as a camp followed by the British as well, subsequently. During the British period, since the latter half of the 19 century, it was used as an office premises with the residence of the Government Agent. The development activities of the historic Kalytara Bodhi in the recent past begging with the Kalutara Buddhist society which was instituted in 1931 through untiring efforts made by Sir Cyril De Zoysa. In 1942 with the commencement of development activities in the lower terrace, the pinnacle of the chithya was laid. After the Sri Lanka became independence, following a request made by Sir Cyril De Zoysa from the first Prime Minister of the country, Right Honorable D.S. Senanayaka, the then Assistant Government Agent of Kalutara, Mr. C.P. De Silva took step to release the kahcheryi on the uda maluwa. Since it was felt that there should be a legal authority to facilitate the development activities, the Bodhi Trust pioneered by Sir Cyril De Zoysa, was established on November 11th 1951. 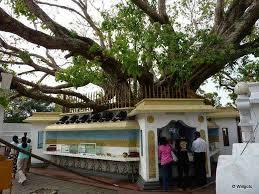 There after, with land around the sacred Bodhi Tree being entrusted to the Kalutara Bodhi Trust by the Government, the area witnessed a speedy development. It was in 1964 that the Foundation stone was laid for the construction of the great chaithya on the uda maluwa following the structure of the “wata da ge”, In 1969 all the lands and buildings which belong to kachchei were entrusted to the Bodhi Trust. By 1976, construction work on the massive “Wata da ge” was completed and the the pinnacle was laid for warship by the public. 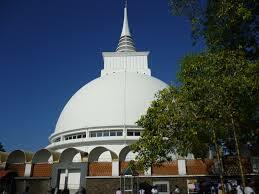 The kalutara Bodhi Trust hold the responsibility of providing security to the Kalutara Bodhi and maintaining the cleanliness and the beauty of the place. It continues with the administrative activities too simultaneously.